Thanks for wandering over to my blog today! I'm still crushing on this new Wild and Wonderful Release from Catherine Pooler Designs. There are some really beautiful stamp sets in the release as well as TWO NEW INKS, so what's not to love about that?! You can find the entire release here. The Wonderful Wildflowers set is my favorite! Today I'm sharing a simple card that carries a huge punch. 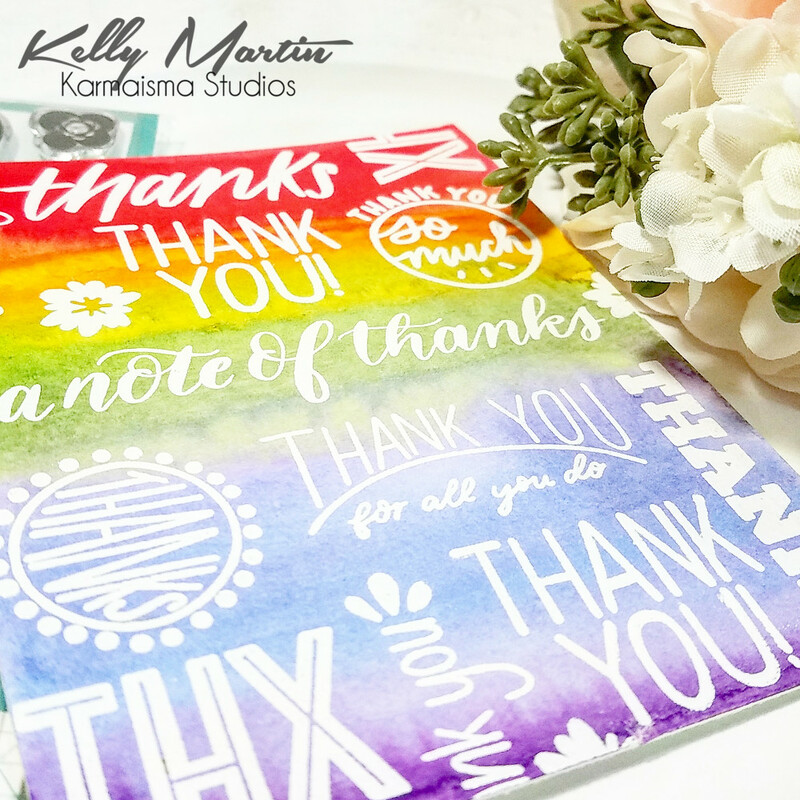 The Note of Thanks stamp set has some great sentiments in it and is one of the most well-designed "thank you" sets I've seen in a while. I cut down a 4.25 x 5.5 inch card panel from watercolor paper and taped it down to a hard surface. Since I planned to apply watercolor, I taped the paper down so that it would lay flat and take the water better. I then pulled out my Gansai Tambi watercolors and laid a rainbow wash of colors down on my card panel. After I heat set that card panel, I applied some baby powder all over the panel since I knew I wanted to emboss and didn't want the powder to stick to the panel. After I prepped the card panel with baby powder, I laid it in my MISTI and arranged my stamps all across the panel. I stamped them with Versamark ink, and then applied white embossing powder before heat setting it. I had a few gaps in my panel, so I placed some stamps in the open areas again and repeated the embossing process until my panel was full. After the panel was complete, I adhered it to a cut and scored 4.25 x 5.5 inch card base to finish off my project.